The first civilizations formed in river valleys, and were characterized by a caste system and a strong government that controlled water access and resources. Rivers were attractive locations for the first civilizations because they provided a steady supply of drinking water and game, made the land fertile for growing crops, and allowed for easy transportation. Early river civilizations were all hydraulic empires that maintained power and control through exclusive control over access to water. This system of government arose through the need for flood control and irrigation, which requires central coordination and a specialized bureaucracy. Hydraulic hierarchies gave rise to the established permanent institution of impersonal government, since changes in ruling were usually in personnel, but not in the structure of government. Water shortage: Water is less available due to climate change, pollution, or overuse. Water crisis: There is not enough fresh, clean water to meet local demand. caste: A form of social stratification characterized by endogamy (hereditary transmission of a lifestyle). This lifestyle often includes an occupation, ritual status in a hierarchy, and customary social interaction and exclusion based on cultural notions of purity and pollution. hydraulic empire: A social or governmental structure that maintains power through exclusive control of water access. Fertile Crescent: A crescent-shaped region containing the comparatively moist and fertile land of otherwise arid and semi-arid Western Asia, and the Nile Valley and Nile Delta of northeast Africa. Often called the cradle of civilization. Neolithic Revolution: Also called the Agricultural Revolution, this was the wide-scale transition of human cultures from being hunter-gatherers to being settled agriculturalists. Water stress: Difficulty in finding fresh water, or the depletion of available water sources. The first civilizations formed on the banks of rivers. The most notable examples are the Ancient Egyptians, who were based on the Nile, the Mesopotamians in the Fertile Crescent on the Tigris/Euphrates rivers, the Ancient Chinese on the Yellow River, and the Ancient India on the Indus. These early civilizations began to form around the time of the Neolithic Revolution (12000 BCE). Rivers were attractive locations for the first civilizations because they provided a steady supply of drinking water and made the land fertile for growing crops. Moreover, goods and people could be transported easily, and the people in these civilizations could fish and hunt the animals that came to drink water. Additionally, those lost in the wilderness could return to civilization by traveling downstream, where the major centers of human population tend to concentrate. The Nile River and Delta: Most of the Ancient Egyptian settlements occurred along the northern part of the Nile, pictured in this satellite image taken from orbit by NASA. Though each civilization was uniquely different, we can see common patterns amongst these first civilizations since they were all based around rivers. Most notably, these early civilizations were all hydraulic empires. A hydraulic empire (also known as hydraulic despotism, or water monopoly empire) is a social or governmental structure which maintains power through exclusive control over water access. This system of government arises through the need for flood control and irrigation, which requires central coordination and a specialized bureaucracy. This political structure is commonly characterized by a system of hierarchy and control based around class or caste. Power, both over resources (food, water, energy) and a means of enforcement, such as the military, are vital for the maintenance of control. Most hydraulic empires exist in desert regions, but imperial China also had some such characteristics, due to the exacting needs of rice cultivation. The only hydraulic empire to exist in Africa was under the Ajuran State near the Jubba and Shebelle Rivers in the 15th century CE. Karl August Wittfogel, the German scholar who first developed the notion of the hydraulic empire, argued in his book, Oriental Despotism (1957), that strong government control characterized these civilizations because a particular resource (in this case, river water) was both a central part of economic processes and environmentally limited. This fact made controlling supply and demand easier and allowed the establishment of a more complete monopoly, and also prevented the use of alternative resources to compensate. However, it is also important to note that complex irrigation projects predated states in Madagascar, Mexico, China and Mesopotamia, and thus it cannot be said that a key, limited economic resource necessarily mandates a strong centralized bureaucracy. in contrast to the decentralized feudalism of medieval Europe. Though tribal societies had structures that were usually personal in nature, exercised by a patriarch over a tribal group related by various degrees of kinship, hydraulic hierarchies gave rise to the established permanent institution of impersonal government. Popular revolution in such a state was very difficult; a dynasty might die out or be overthrown by force, but the new regime would differ very little from the old one. Hydraulic empires were usually destroyed by foreign conquerors. Access to water is still crucial to modern civilizations; water scarcity affects more than 2.8 billion people globally. Water stress is the term used to describe difficulty in finding fresh water or the depletion of available water sources. Water shortage is the term used when water is less available due to climate change, pollution, or overuse. Water crisis is the term used when there is not enough fresh, clean water to meet local demand. Water scarcity may be physical, meaning there are inadequate water resources available in a region, or economic, meaning governments are not managing available resources properly. The United Nations Development Programme has found that water scarcity generally results from the latter issue. The Akkadian Empire flourished in the 24th and 22nd centuries BCE, ruled by Sargon and Naram-Sin. It eventually collapsed in 2154 BCE, due to the invasion of barbarian peoples and large-scale climatic changes. The Akkadian Empire was an ancient Semitic empire centered in the city of Akkad and its surrounding region in ancient Mesopotamia, which united all the indigenous Akkadian speaking Semites and the Sumerian speakers under one rule within a multilingual empire. King Sargon, the founder of the empire, conquered several regions in Mesopotamia and consolidated his power by instating Akaddian officials in new territories. He extended trade across Mesopotamia and strengthened the economy through rain-fed agriculture in northern Mesopotamia. The Akkadian Empire experienced a period of successful conquest under Naram-Sin due to benign climatic conditions, huge agricultural surpluses, and the confiscation of wealth. The empire collapsed after the invasion of the Gutians. Changing climatic conditions also contributed to internal rivalries and fragmentation, and the empire eventually split into the Assyrian Empire in the north and the Babylonian empire in the south. Akkadian Empire: An ancient Semitic empire centered in the city of Akkad and its surrounding region in ancient Mesopotamia. Sargon: The first king of the Akkadians. He conquered many of the surrounding regions to establish the massive multilingual empire. Gutians: A group of barbarians from the Zagros Mountains who invaded the Akkadian Empire and contributed to its collapse. Cuneiform: One of the earliest known systems of writing, distinguished by its wedge-shaped marks on clay tablets, and made by means of a blunt reed for a stylus. Semites: Today, the word “Semite” may be used to refer to any member of any of a number of peoples of ancient Southwest Asian descent, including the Akkadians, Phoenicians, Hebrews (Jews), Arabs, and their descendants. Naram-Sin: An Akkadian king who conquered Ebla, Armum, and Magan, and built a royal residence at Tell Brak. The Akkadian Empire was an ancient Semitic empire centered in the city of Akkad, which united all the indigenous Akkadian speaking Semites and Sumerian speakers under one rule. The Empire controlled Mesopotamia, the Levant, and parts of Iran. 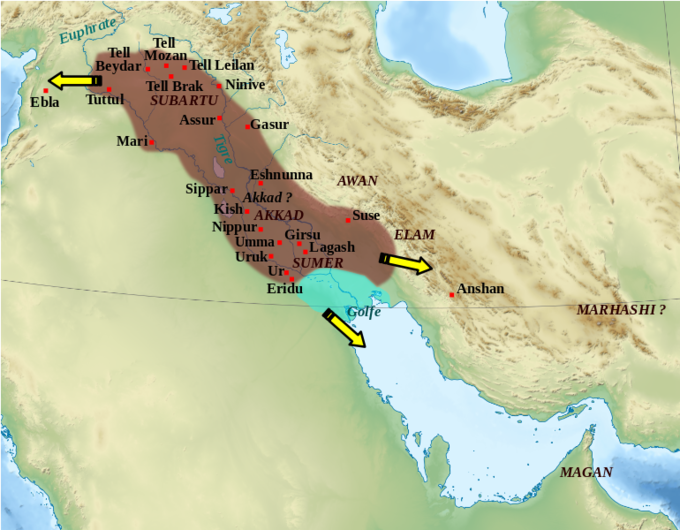 Map of the Akkadian Empire: The Akkadian Empire is pictured in brown. The directions of the military campaigns are shown as yellow arrows. Its founder was Sargon of Akkad (2334–2279 BCE). Under Sargon and his successors, the Akkadian Empire reached its political peak between the 24th and 22nd centuries BCE. Akkad is sometimes regarded as the first empire in history. Sargon’s empire reached westward as far as the Mediterranean Sea and perhaps Cyprus (Kaptara); northward as far as the mountains; eastward over Elam; and as far south as Magan (Oman)—a region over which he purportedly reigned for 56 years, though only four “year-names” survive. He replaced rulers with noble citizens of Akkad. Trade extended from the silver mines of Anatolia to the lapis lazuli mines in Afghanistan, and from the cedars of Lebanon to the copper of Magan. The empire’s breadbasket was the rain-fed agricultural system of northern Mesopotamia (Assyria), and a chain of fortresses was built to control the imperial wheat production. Sargon managed to crush his opposition even in old age. Difficulties also broke out in the reign of his sons, Rimush (2278–2270 BCE), who was assassinated by his own courtiers, and Manishtushu (2269–2255 BCE), who reigned for 15 years. He, too, was likely assassinated in a palace conspiracy. 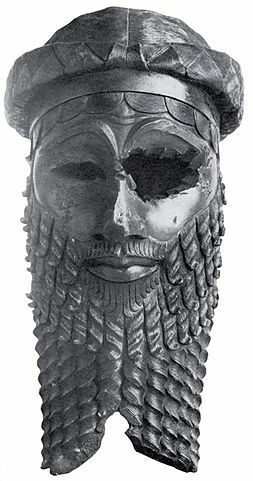 Bronze head of a king: Bronze head of a king, most likely Sargon of Akkad but possibly Naram-Sin. Unearthed in Nineveh (now in Iraq). Stele of Naram-Sin: This stele commemorates Naram-Sin’s victory against the Lullubi from Zagros in 2260 BCE. Naram-Sin is depicted to be wearing a horned helmet, a symbol of divinity, and is also portrayed in a larger scale in comparison to others to emphasize his superiority. Manishtushu’s son and successor, Naram-Sin (called, Beloved of Sin) (2254–2218 BCE), assumed the imperial title “King Naram-Sin, King of the Four Quarters.” He was also, for the first time in Sumerian culture, addressed as “the god of Agade (Akkad).” This represents a marked shift away from the previous religious belief that kings were only representatives of the people toward the gods. Naram-Sin conquered Ebla and Armum, and built a royal residence at Tell Brak, a crossroads at the heart of the Khabur River basin of the Jezirah. Naram-Sin also conquered Magan and created garrisons to protect the main roads. This productive period of Akkadian conquest may have been based upon benign climatic conditions, huge agricultural surpluses, and the confiscation of the wealth of other peoples. Future Mesopotamian states compared themselves to the Akkadian Empire, which they saw as a classical standard in governance. The economy was dependent on irrigated farmlands of southern Iraq, and rain-fed agriculture of Northern Iraq. There was often a surplus of agriculture but shortages of other goods, like metal ore, timber, and building stone. Art of the period often focused on kings, and depicted somber and grim conflict and subjugation to divinities. Sumerians and Akkadians were bilingual in each other’s languages, but Akkadian gradually replaced Sumerian. The empire had a postal service, and a library featuring astronomical observations. The Empire of Akkad collapsed in 2154 BCE, within 180 years of its founding. The collapse ushered in a Dark Age period of regional decline that lasted until the rise of the Third Dynasty of Ur in 2112 BCE. By the end of the reign of Naram-Sin’s son, Shar-kali-sharri (2217-2193 BCE), the empire had weakened significantly. There was a period of anarchy between 2192 BC and 2168 BCE. Some centralized authority may have been restored under Shu-Durul (2168-2154 BCE), but he was unable to prevent the empire collapsing outright from the invasion of barbarian peoples, known as the Gutians, from the Zagros Mountains. Little is known about the Gutian period or for how long it lasted. Cuneiform sources suggest that the Gutians’ administration showed little concern for maintaining agriculture, written records, or public safety; they reputedly released all farm animals to roam about Mesopotamia freely, and soon brought about famine and rocketing grain prices. The Sumerian king Ur-Nammu (2112-2095 BCE) later cleared the Gutians from Mesopotamia during his reign. The collapse of rain-fed agriculture in the Upper Country due to drought meant the loss of the agrarian subsidies which had kept the Akkadian Empire solvent in southern Mesopotamia. Rivalries between pastoralists and farmers increased. Attempts to control access to water led to increased political instability; meanwhile, severe depopulation occurred. After the fall of the Akkadian Empire, the Akkadian people coalesced into two major Akkadian speaking nations: Assyria in the north, and, a few centuries later, Babylonia in the south. The city-state of Ur in Mesopotamia was important and wealthy, and featured highly centralized bureaucracy. It is famous for the Ziggurat of Ur, a temple whose ruins were discovered in modern day. Ur was a major Sumerian city-state located in Mesopotamia, founded circa 3800 BCE. Cuneiform tablets show that Ur was a highly centralized, wealthy, bureaucratic state during the third millennium BCE. The Ziggurat of Ur was built in the 21st century BCE, during the reign of Ur-Nammu, and was reconstructed in the 6th century BCE by Nabonidus, the last king of Babylon. Control of Ur passed among various peoples until the Third Dynasty of Ur, which featured the strong kings Ur-Nammu and Shulgi. Ur was uninhabited by 500 BCE. Sumerian: A group of non-Semitic people living in ancient Mesopotamia. Cuneiform: Wedge-shaped characters imprinted onto clay tablets, used in ancient writing systems of Mesopotamia. Sargon the Great: A Semitic emperor of the Akkadian Empire, known for conquering Sumerian city-states in the 24th and 23rd centuries BCE. Ziggurat: A rectangular stepped tower, sometimes surmounted by a temple. Cuneiform tablets show that Ur was, during the third millennium BCE, a highly centralized, wealthy, bureaucratic state. The discovery of the Royal Tombs, dating from about the 25th century BCE, showed that the area had luxury items made out of precious metals and semi-precious stones, which would have required importation. Some estimate that Ur was the largest city in the world from 2030-1980 BCE, with approximately 65,000 people. The City of Ur: This map shows Mesopotamia in the third millennium BCE, with Ur in the south. The Ziggurat of Ur: This is a reconstruction of Ur-Nammu’s ziggurat. This temple was built in the 21st century BCE, during the reign of Ur-Nammu, and was reconstructed in the 6th century BCE by Nabonidus, the last king of Babylon. The ruins, which cover an area of 3,900 feet by 2,600 feet, were uncovered in the 1930s. It was part of a temple complex that served as an administrative center for the city of Ur, and was dedicated to Nanna, the moon god. Between the 24th and 22nd century BCE, Ur was controlled by Sargon the Great, of the Akkadian Empire. After the fall of this empire, Ur was ruled by the barbarian Gutians, until King Ur-Nammu came to power, circa 2047 – 2030 BCE (the Third Dynasty of Ur). Advances during this time included the building of temples, like the Ziggurat, better agricultural irrigation, and a code of laws, called the Code of Ur-Nammu, which preceded the Code of Hammurabi by 300 years. Shulgi succeeded Ur-Nammu, and was able to increase Ur’s power by creating a highly centralized bureaucratic state. Shulgi, who eventually declared himself a god, ruled from 2029-1982 BCE, and was well-known for at least two thousand years after. Three more kings, Amar-Sin, Shu0Sin and Ibbi-Sin, ruled Ur before it fell to the Elamites in 1940 BCE. Although Ur lost its political power, it remained economically important. It was ruled by the first dynasty of Babylonia, then part of the Sealand Dynasty, then by the Kassites before falling to the Assyrian Empire from the 10th-7th century BE. After the 7th century BCE, it was ruled by the Chaldean Dynasty of Babylon. It began its final decline around 550 BCE, and was uninhabited by 500 BE. The final decline was likely due to drought, changing river patterns and the silting of the Persian Gulf.